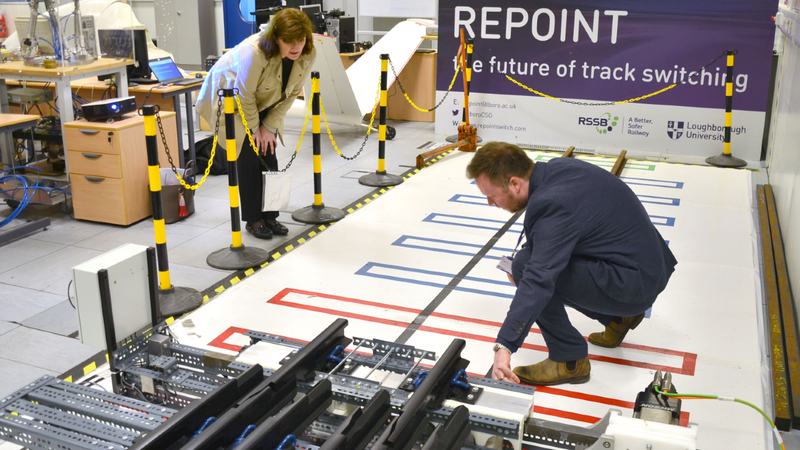 Nicky Morgan, Chair of the Treasury Select Committee and former Secretary of State for Education, spent Monday morning at Loughborough University learning about Repoint – innovative track switching technology developed by Loughborough University with delivery partners DEG Signal (now part of Ramboll) and Progress Rail. The visit was organised by the Railway Industry Association (RIA) 2019 Rail Fellowship Programme, which gives UK parliamentarians and commentators the opportunity to gain an insight into the valuable work of the UK rail supply chain. Read here for more details about Repoint technology; the benefits it could bring to rail passengers and the role that Ramboll has played in its development. Repoint is an electromechanical device designed to improve the reliability of the points in the railway network where trains transfer from one line to another. Based on fault tolerant engineering principles, it is an alternative to conventional track switches. It has the potential to reduce track maintenance costs and increase capacity on rail networks in the UK and around the world by reducing disruption to train traffic at signals and points. Ramboll supported the development with all aspects of signalling design, from lab-tests to full scale demonstration.